SINGAPORE - The British Council is presenting an exhibition of fashion film, Dressing the Screen which will be an official fringe event of Digital Fashion Week Singapore 2013 British Exchange. 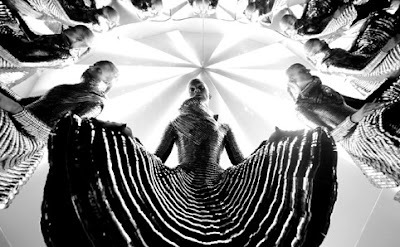 Curated by filmmaker Kathryn Ferguson and designed by SystemSovereign X Fuur, it will explore the origins, history and pioneering role UK filmmakers and designers have played in the development of fashion film. Featured designers and filmmakers will include SHOWstudio’s Nick Knight and Ruth Hogben, Vivienne Westwood, and Henry Holland Pivotal moments in fashion, film and technology - from pre-internet early experiments such as the early films of Ossie Clark, Zandra Rhodes and Bella Freud - to visionary technological advancements by filmmakers such as Nick Knight and Sølve Sundsbø will be displayed. The exhibition will also explore the ground breaking work of female filmmakers and how they respond to shooting the female form with work by Marie Schuller, Amanda Boyle for Mulberry and Elisha Smith-Leverock. Commissioned by the British Council, Dressing the Screen is an on-going fashion film project which has run in 10 countries including China, Bosnia and the Philippines; bringing together British and local filmmakers and designers to create new fashion films. Digital Fashion Week is collaborating with the British Council for the second shoppable live-streamed fashion week taking place in Singapore from 1 to 4 November 2013. The interactive event will enable online viewers to access the shows through social media platforms. Daily interviews with models and designers will be streamed on Google+. Shoppers will be able to purchase the clothes straight from the runway via Asos Marketplace as they watch the live-streamed catwalks. This year, the focus is on celebrating Singapore’s connection with the British fashion industry.